This is a real crowd-pleaser. 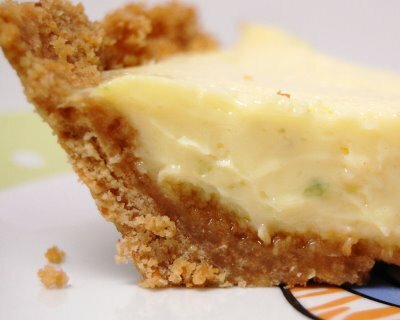 The Key Lime Pie is the “state pie” of Florida! Whisk the egg yolks and lime zest together in a bowl for about 2 minutes or until tinted light greenish yellow. Whisk in the milk, then juice and set aside until it thickens. Mix graham cracker crumbs and sugar in a bowl. Make sure its a very fine crumb. Add butter, honey, and stir with a fork or fingers until well blended. Drop this mixture into a 9-inch pie tin and press over the bottom and up the sides of the pan. You can use a metal measuring cup or anything with a flat firm bottom. It doesn’t have to be perfect, but make sure its firm. Bake for about 10 minutes. Remove and allow to cool. Pour the filling into crust, spread evenly, and then bake for 15 minutes. Remove from the oven and cool to room temperature before refrigerating. Chill for a few hours or overnight before serving. I like to make two and freeze one for another day. *Defrost in the fridge over night.